These crackers are so cheesy that if they were orange and shaped like squares, you’d think you were eating Cheez-Its. 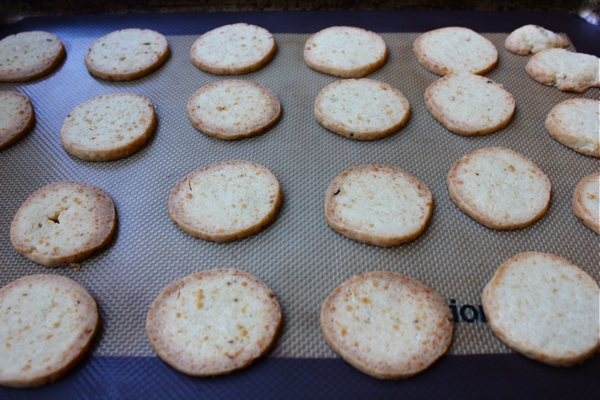 Surprisingly, it is really easy to make crackers from scratch as long as you have a food processor. It was fun, and I will definitely make more with different flavors and shapes. This batch of crackers has a mix of cheddar and gruyère cheeses with a hint of red pepper flakes. They are a little too cheesy to snack on alone, but they are perfect as a palate cleanser between sips of wine. Cheese and crackers all in one bite! 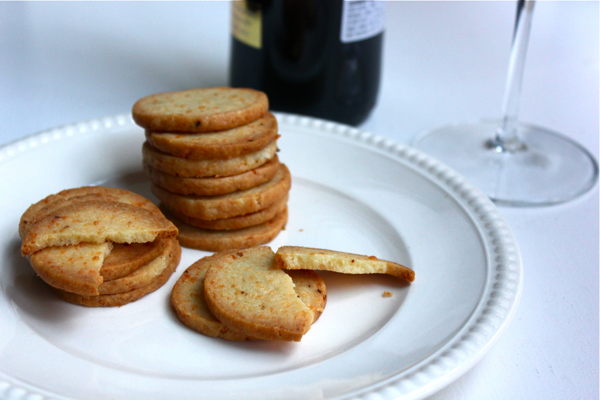 To make about 50 of these crackers, grate 1/2 pound of a sharp cheddar, a gruyère, or a cheddar-gruyère melange. 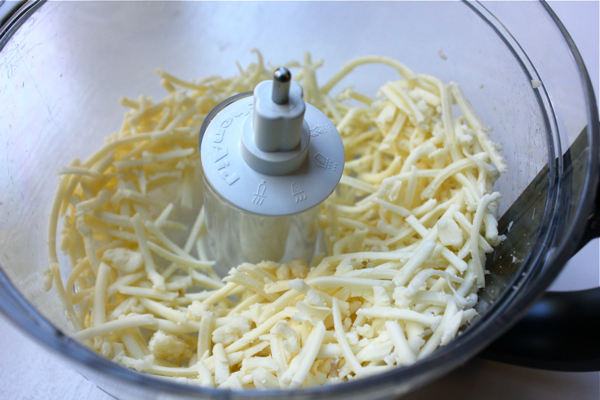 Put the cheese into a food processor along with 1 stick of room temperature butter (1/2 cup), 1 egg, 1 teaspoon of dijon mustard, and 1 teaspoon of red pepper flakes. 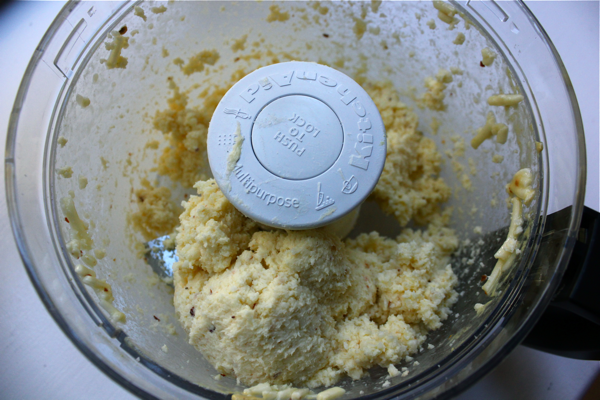 Run the food processor until these ingredients are smooth. 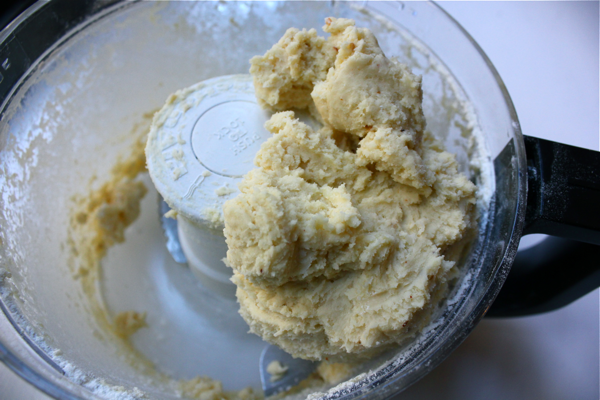 Next, add 1 1/4 cups of flour to the food processor, and run it until the dough comes together into a ball. 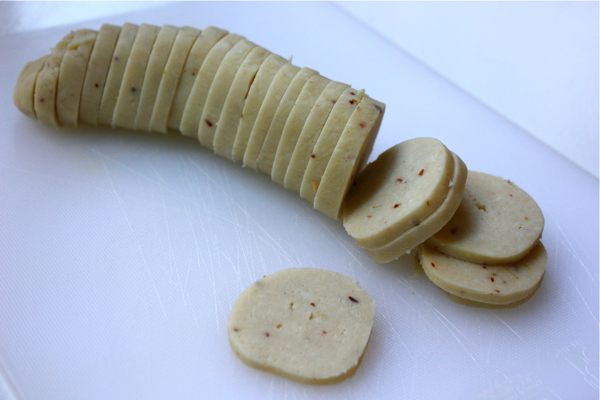 Remove the dough from the food processor, and shape it into a long log that is 2 inches thick. Surprisingly, the dough isn’t very sticky and holds together well. Wrap the log in plastic wrap, and put it in the fridge for about 4 hours or until it is very firm. Alternatively, you could make the dough the day before a party, leave it in the fridge overnight, and bake the crackers the next day. Once firm, take the log of cracker dough out of the fridge and remove the plastic wrap. Preheat your oven to 350ºF. Using a sharp knife, slice the log into rounds that are 1/8 of an inch thick. Try to keep the slices uniform so that the crackers bake evenly. Place the slices on an ungreased baking sheet about 1/2 inch apart from each other. Bake the crackers for 7 minutes, and then rotate the pan. Bake them for another 7 minutes or until they begin to brown around their edges. Let the crackers cool and crisp before eating. Happy munching at your next cocktail hour! This recipe is adapted from Martha Stewart’s Everyday Food magazine.